The lower school gym was magically transformed into “the enchanted kingdom of Harker” when, in early April, it was taken over by a live television crew from WOLF TV, Channel 18. So began the library department’s 18th annual Ogre Awards. In a new twist this year, an imaginary TV network covered the “star-studded literary awards show,” which it deemed the highest-rated program in Fairyland. 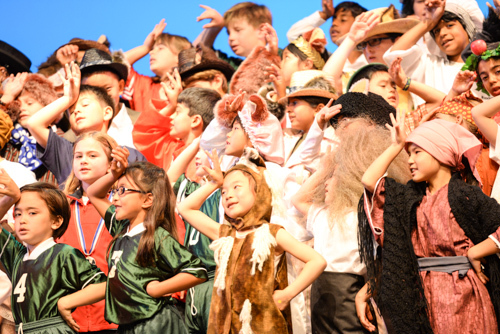 Starring all grade 2 students (otherwise known as the Ogre Academy), the awards show was dedicated to the characters of 21 classic folk and fairy tales, as well as the storytellers who created them. The beloved production was created by former library director Enid Davis. Since her retirement two years ago, the library department has proudly carried on the tradition of hosting the Ogres with Danny Dunn, lower school technical director, serving as director. The idea behind this year’s Ogre Awards, which was emceed by lower school librarian Kathy Clark, was to take stories that have been around for in many cases centuries and to show them holding their own against television, explained Dunn. “We wanted to compare books and stories to television – the point being that whatever you might enjoy about television, there is always a book or story that could fill that entertainment need. Books are just as relevant and entertaining as TV – in fact, we would argue more so!” she said. The second graders enthusiastically portrayed characters and creatures from the folklore of cultures worldwide (including enchanted royalty and objects, fools, witches, heroines, villains, tricksters and, of course, wolves), which they had learned about during the school year. Folk stories and fairytales featured in this year’s awards ceremony came from such well-known, endearing stories as The Frog Princess, Snow White, The Water of Life, Butterball, Peder and the Water Sprite and more. During the show, a whole host of special guests from the faculty and staff presented the awards, which took many forms such as the “publisher’s fairyhouse” sweepstakes check, and a plaque in the sports hall of fame. All but one of the Ogre Awards are bestowed upon fairytale characters, with a special honor going to a real person who provides exceptional service or support to the Harker libraries. This year the honor went to lower school library assistant Moureen Lennon, who oversees library volunteers and champions the Fifth Grade Reads project. In her acceptance speech, Lennon said she was thrilled to receive the 2014 Special Ogre Award for Lifetime Achievement. She then recalled the explosive growth of the lower school library, which she said began primarily as a center for storytelling and has since become a “full-fledged literary service.” She also praised the library’s dedicated group of parent volunteers, many of whom have stayed on even after their children matriculated to higher campuses. Toward the end of the show, all of the student wolves took to the stage in protest of their perceived exclusion in the Ogre Awards. Holding picket signs, they chanted their outrage until special guest Sarah Leonard, primary school head, observed that there were more wolves on stage than in any other year’s awards show – at which point they promptly stopped complaining and apologized in unison. Concluding the Ogre Awards was the much-anticipated Best Folk or Fairy Tale award, which this year went to the Norwegian fairytale “Butterball.” Leonard then approached the podium to thank the dedicated team (of volunteer faculty and parents), both on hand and behind the scenes, who generously helped out with technical direction, music, costumes, videography and choreography. Although the audience undoubtedly recognized many familiar tales, several of the stories told were new to the Ogres this year. This year also saw the introduction of a new category expanded to include all villains (in addition to witches, which have their own category). “We are happy to report you can expect wolves to continue to make an appearance in future years along with other audience-eating villains,” said Dunn.